These curtains are pretty fantastic. They are heavy, so make sure you have a strong rod with a central support. I hemmed them, ironed them on med-low and hung them with drapery hooks so they could be drawn easily. They have a high-end look, almost like the real thing. Because of the blackout material, the white color has a very slight gray/silver sheen. That worked with my daughter's pink/gray/white room but might not work for everyone, so be advised if your décor is warmer hues. This striking polyester and faux silk curtain completely darkens the room without needing a lot of upkeep. 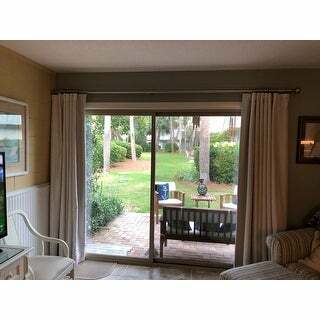 Dress up your windows with this extra-wide textured curtain, and gain privacy and style in the process. Dimensions 30.0 In. X 14.0 In. X 7.0 In. 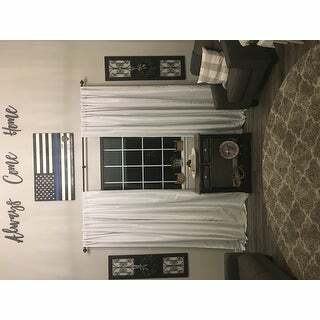 Ordered two in the peacock 108" length for a living room with 9 ft ceilings because i wanted panels that would hand from the wall near the ceiling to the floor. The extra-wide fully covers two side-by-side windows when closed, and frames them beautifully when open. I hung them so the curtain fabric edge is just where the window begins so they don't block any light when the curtains are pulled open, and instead just cover empty wall space. I love the color (a true peacock blue to me), the texture is nice and not at all cheap looking, and the lining provides really good light blockage. I also love that I can use the back tab for easy opening and closing. It wasn't easy finding extra-wide 108" length curtains to begin with, but Overstock had a good selection at the best price, and I searched! This is a great product that I'm very happy with. I tried looking for extra wide curtains and came across these. I wanted a linen look in my living room, but couldn't find any that were wide enough and blocked light. 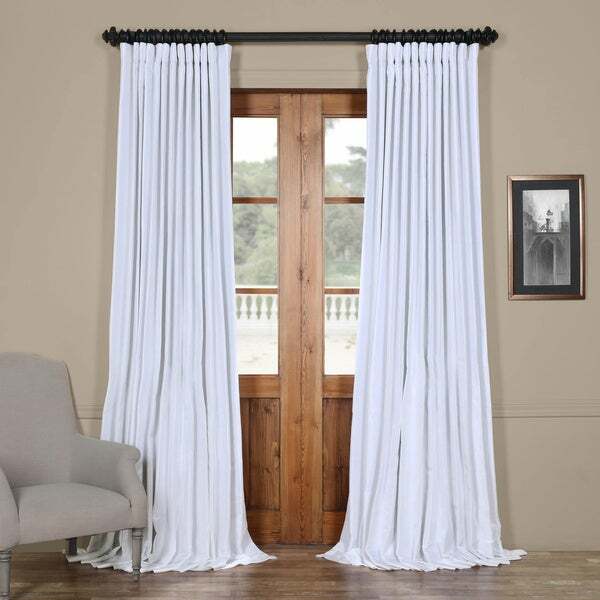 I was hesitant to get faux silk online as everything I saw of faux silk curtains were cheap looking. These are the exception. Absolutely beautiful and can go in a formal or informal room. I got the off white color which is more like a light oatmeal or sand color and they are spot on perfect. I hung them without O rings as I wanted to see how they would look first. I plan to get the o rings now and get a nicer rod than the cheap one I got as these curtains are heavy! But that's the beauty of them. They look like I spend 4 times the price. They darken a room which is perfect for my living room but now I plan to get a pair of sheer curtains to hang behind them for when I want privacy but still light. Get these and you won't be disappointed. Beautiful drapes but more room darkening than blackout. The drapes I replaced did not allow any light in. These darken the room but you can see that it’s light outside. Still ok for my purpose but don’t get them if you want it pitch black in your room. There's also a few inches at the bottom where a lot of light comes in because darkening lining is shorter than silky drape. I wish they were the same length. Fabric looks expensive. I got the off white and am happy with the color. I bought these curtain in gray, their width are 100 inches. I like that I don't have to put two curtain per window. They look more stylish, clean also.The choice of length is a plus. I like the faux silk look, just the right amount of shing. I love the color and texture. The 100 inch width works great with my 3 glass casement window. These curtains gave our bedroom a wow factor! They are absolutely beautiful and very well made. I hung them with rings (not necessary because they have pockets) because we prefer that look. My wife is very pleased and I hung these within 30 minutes of opening the package. The color was just as pictured. I would have spent at least double going to a storefront. With 2 sets of rings (28 total rings), an adjustable extra wide rod and 2 extra wide, extra long curtains, I spent *** Thanks, Overstock! Our bedroom looks great, the curtains block out light very well, we can sleep in on Saturdays, and I have a feeling I'll be rewarded in the bedroom for the purchase in more ways than one. These curtains are heavy and beautiful. They look like silk and I get so many compliments on them. Excellent quality, the Storm Gray is a lovely color. I had just purchased 2 extra wide, blackout curtains for a different room, from a well known retailer, for hundred of dollars more than I paid for 4 of these. They are VERY SIMILAR, but these were a much nicer and heavier curtain than the ones I had just purchased from the retailer. After comparing, I returned those and I am ordering more of these for other room in my home. Its amazing how "real" these faux silk curtains look . Very nicely made - they look more expensive than the price. If you need a true white this is a great choice. Nice quality curtains. Can be hung 3 ways. Haven't been able to find this size elsewhere for an affordable price..this one fits the bill perfectly! Looks like the PB type I wanted but the price is much more approachable here and the looks is exact!!!!! Got the gray smoke and its beautiful. Not as silky as the photos show, however still very nice and fairly blacked out. Beautiful curtains. Heavy. Blackout is perfect. Really white white which is what I wanted. Definitely get a rod that can manage the weight. These beautiful drapes did not disappoint! They were exactly what I was expecting based on the pictures and description on your website. The color of the fabric is deep and rich with highly-lustrous surface! They look like custom drapes and I love the texture of the weave!!! I highly recommend these luxe panels for anyone craving a high end look with a price that is kind on anyone's budget!!! 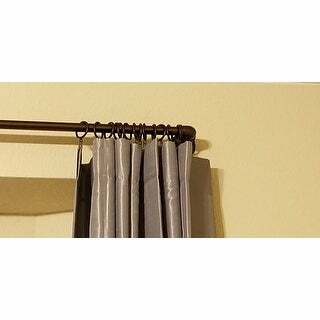 Great simple curtains if you are looking for something with blackout. I added buckram to the top along with curtain hooks in order to hang them on rings and they look really beautiful. Love these Curtains! They are perfect for my daughter's bedroom. Super heavy and perfect for a large window. Fast shipping and wonderful customer service. These are pretty close to near black out curtains. They are a bit shiny and add class to the room. I would recommend! Very nice product. Always pleased with Overstock mechandise. I truly love the look of my curtains. The quality is great and the Faux-Silk was absolutely perfect. I loved them so much I made another purchase before they would run out. You won’t be disappointed with the product. "What color is the lining on the Ivory ? And can they be opened and closed easily if you hang them on back tabs?" The lining is an off white color. Generally it is easier to open curtains when they are attached to curtain rings rather than scooting the tabs along the pole. The rings slide over a curtain rod much easier, especially on a high window. "These do not look like tab top to me. I am using them behind an existing curtain and the tabs on this curtain hang down about three inches. Can anyone help me?" If you'd like the curtains raised more, we recommend using drapery pins. "I am looking for the color ICE in 84 inch length. Is it out of stock or not available at all? If just out of stock, when will it be available?" "Is the price listen for a pair of the curtains or just one? " "Do these have drapery hooks to use with rings? Or do I need to buy rings with hooks? " "Can these be installed with hooks on traverse rod?" Yes, it can be installed with the use of drapery pins/hooks. "Are these returnable if the color isn’t what I need? " Yes, but you pay high shipping.